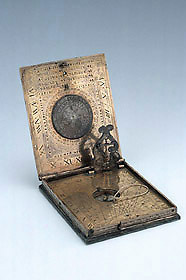 This instrument, which has also been called a compendium, consists of four sundials, a lunar volvelle, a horary volvelle, a compass, a plumb level and an astronomical table. The two horizontal pin gnomon sundials are (inexplicably) very similar to each other and there is also both a vertical and a horizontal string gnomon sundial. The dial appears to be the only surviving instrument by Georg Karl.